Ganondorf uses Dark Dive on Link. Dark Dive (雷神掌, Raijin Palm) is the up special move used by Ganondorf, introduced in Super Smash Bros. Melee. 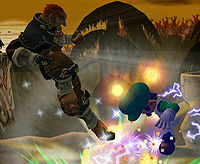 It's similar in function to Captain Falcon's Falcon Dive, but instead of the opponent getting hurt by fire, they will be shocked by electricity if Ganondorf connects with them. Like his side special, Flame Choke, it counts as a grab, so it cannot be shielded or countered. Like the Falcon Dive, it can be used repeatedly if successful, and Ganondorf can grab a ledge at the peak height of this move when facing the other direction. This helps to sweet spot and prevents Mario players from caping. However, the move suffers from predictability, poor distance, lack of protection, and in the case of Brawl, low attack power. The move itself is essentially a clone move of Falcon Dive, except that there are electric effects. He rises up, catching opponents that are above him, zaps them, and then knocks the opponent away with an explosion for a total of 17% damage, and can use this move again after if it is successful. Also, as with most moves Ganondorf has compared to Falcon, the move is stronger than Falcon Dive, and is easier to KO foes with (though Falcon Dive is still strong by itself), reliably killing around 150% from the center of Final Destination. It is interesting to note that, unlike Falcon Dive, Dark Dive can harm other characters (in addition to the victim Ganondorf has latched on to) via the electrical hitboxes, making it harder for an opponent to hit Ganondorf out of this move. However, it cannot grab or affect foes on a ledge, making this move prone to edge-guarding and edgehogging. Using Dark Dive on an opponent below stage level will often stage spike them. While this can punish a failed edge-guard, the opponent can also tech the spike, and then strike back as they can move before Ganondorf can. 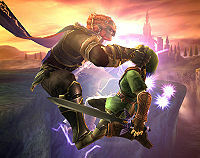 Ganondorf can still grab opponents with his Dark Dive, but if the move does not connect until the end of the animation, Ganondorf does a 7% damaging uppercut with a deceptively large and disjointed reach that knocks the opponent away vertically with darkness damage, being slightly stronger but less damaging than the move's grab and throw. In addition, Ganondorf can now grab opponents hanging onto the ledge, which often stage spikes them, but they are still capable of teching. It also has armor mid-grab. The move is also capable of destroying targets in Target Smash!! when his body comes in contact with the target. It also has a different animation where Ganondorf rises upward and spins and no longer spins forward during the ending's descent. However, Dark Dive was overwhelmingly nerfed, dealing 11% damage and, outside of stage spikes, only KOing at 300% with the grab (from the center of Final Destination) and 200% with the uppercut (anywhere on the ground of Final Destination). This extremely poor knockback combined with the new mechanic of being able to act out of hitstun much sooner allows opponents with low damage percentages and fast aerials to immediately hit Ganondorf once they are released from the grab, which can cause gimps and overall makes the move unsafe to use. In addition its crippled damage, the move has slightly more difficulty in turning around, slightly more start-up, and slightly less reach on its furthest grabbox. While it is possible for the uppercut to KO near the upper blast line, it is difficult to accomplish due to the move's weak knockback and no reliable set-ups for it. 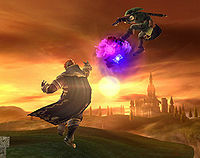 In The Subspace Emissary, Ganondorf attacks Tabuu with his Dark Dive after he finds out Tabuu is controlling Master Hand with his Chains of Light. The distance Ganondorf travels with Dark Dive seems to be highly exaggerated. Before he hits Tabuu, Ganondorf gets hit by a counterattack, turning him into a trophy. Dark Dive was initially nerfed from its Brawl iteration due to the removal of the mid-grab's armor, making it much easier to intercept and edge-guard. However, due to the removal of Brawl's mechanic of fast acting out of hitstun when knocked short distances, the grabbed opponent can no longer attack him once he releases them. Ganondorf now aesthetically grabs the opponent with one hand instead of two. Dark Dive's power was improved in 1.1.3, where the grab does 13.8% damage with significantly improved knockback, and is now a decent out of shield move. However, the power increase is still quite underwhelming compared to Melee, as it doesn't gain KO potential until around roughly 200% from Final Destination's center and 140% near the ledge. Dark Dive as shown by a Skill Preview in Ultimate. Dark Dive was buffed considerably from Smash 4: It's grab damage was increased to 16.6%, and the throw's power was drastically increased to KO at 89% near the edge of Final Destination and 130% from the center, being much more powerful than it was in Melee. The throw also has less ending lag, allowing Ganondorf to act more quickly out of the move. The fiery explosion that was created had been changed to a vibrant burst of purple magic, now possessing the electric effect. "Jump up and grab an enemy,and then shock and launch them." "Punch opponents into the air, and then hit them in midair to send them higher." "Jump extra high, but you can only grab at the beginning or end of the attack." Dark Fists: Instead of grabbing the enemy, Ganondorf gains a hitbox on the move's start-up. The first hit, dealing 6% damage, is thrown before the jump, and has set knockback. If it connects it will usually chain victims into the second hit, dealing 11% damage for a total of 17% damage, which is thrown at the apex of the jump and has formidable damage and knockback, able to KO as low as 80% anywhere on the stage and 110% from underneath the stage while the opponent is on ground level, making it very risky to intercept. It is generally considered superior to Dark Dive and Dark Vault due to having legitimate offensive use, improved distance thanks its somewhat slow start-up allowing for better horizontal reach, and the start-up also possessing armor which further bolsters its anti-edge-guarding capabilities and can even be used as a pseudo-counter. However, the lack of a grab means that the move cannot be used in rapid succession should it hit an opponent. Dark Vault: Vaults upward twice, but does not give a noticeable amount of increased distance, and can only grab during the beginning of either vault, and has no ending uppercut. Has less horizontal distance, the electrocution ends faster but deals drastically less damage (1% electrocution, 3% throw, 4% total), and the explosion has less knockback power that KOs at 400% instead. There also is some lag between the two vaults, making it much easier to edge-guard. Electrocutes the grabbed opponent before producing an explosion, whereas Falcon Dive immediately grabs and explodes. Has the electric effect on the multi-hits, and the throw in Ultimate. Falcon Dive has no such effects. Deals 11% total damage in Brawl, 6% less than Falcon Dive; 13.8% total damage in Smash 4, 3.2% less than Falcon Dive; and 16.6% in Ultimate, 1.4% less than Falcon Dive. Deals 17% total damage in Melee, 2% more than Falcon Dive. Much stronger knockback in Melee and Ultimate than Falcon Dive. However, much weaker knockback in Brawl and slightly weaker in Smash 4. In Brawl, many characters can hit Ganondorf after release at mid percents or higher due to its drastically weaker knockback and the hitstun changes. Dark Dive travels slower than Falcon Dive. Dark Dive travels more vertical distance than Falcon Dive in Melee and more horizontal distance since Brawl. Dark Dive travels less vertical distance than Falcon Dive after Melee. After Melee, Dark Dive hits with an uppercut that deals 7% darkness damage if he doesn't grab the opponent earlier in the move, whereas Falcon Dive lacks such a hitbox. In Melee, victims don't visibly wince from this attack, with the exception of Yoshi. In Melee, the multi-hit hitboxes of the move may fail to connect on characters of a significantly different size than Ganondorf, such as a tiny Kirby or a giant Wire Frame. When this happens, the move deals significantly less damage and ends faster. In Brawl, the grab box can not break a Smash Ball, along with Captain Falcon's Falcon Dive, though the uppercut can break them and the grab box can break targets in Target Smash!! and hit enemies and Bosses in the Subspace Emissary and in the Boss Battles. This page was last edited on March 19, 2019, at 19:26.